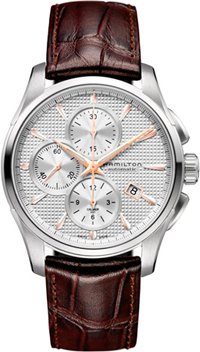 New from the time of Hamilton with the original name Jazzmaster Auto Chrono is a combination of great design and the latest innovations watchmaking. Unique model Jazzmaster Auto Chrono is presented in a round housing with a diameter of 42 mm stainless steel. There are three versions of the model – with black, silver and silver with gold-plated hour markers superimposed dials. The dials are all decorated in shades «Clous de Paris’» and have three counters at hour markers, “12:00”, “6:00” and “9:00.” Indication of hours, minutes and seconds by using three central hands. Small aperture date is set to “4:00.” Due to the special form of sapphire glass with anti-reflective coating provides maximum readability dial. Water Resistant – 100 meters. New Jazzmaster Auto Chrono is collected on the basis of the manufacturing mechanism of H-21, which was developed recently. Caliber is equipped with 60-hour power reserve. Buy Watches Jazzmaster Auto Chrono can be on a stainless steel bracelet or leather strap in black or brown. The cost of new items – from 1725 $.